If you like premium espresso, you probably want to have it available in your home as well. Hence the newfound popularity of single serving coffee makers. if you’re a fan of Starbucks in particular, you can now get their espresso with the new Verismo System by Starbucks. The Verismo system lives up to the Starbucks standard and we were impressed with the taste and the ease of use. The unit is beautifully designed so it will fit nicely in any kitchen and it’s very well-made with a small footprint. 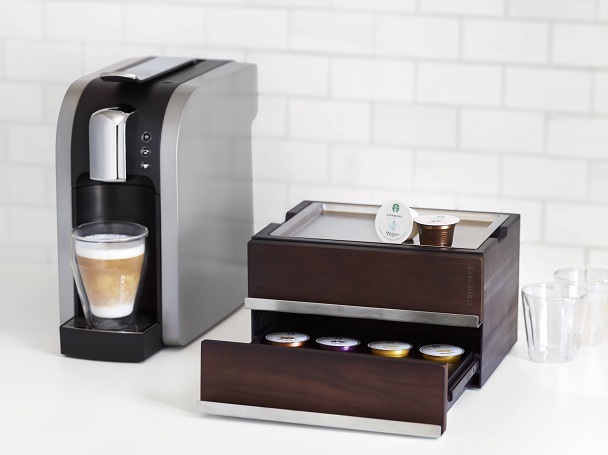 The Verismo uses pods like other single serving coffee makers, but here you use Starbucks pods that use the exact same coffee that Starbucks uses in their cafes and in their packaged coffee. You can use it to brew an espresso, regular brewed coffee, lattes and even an Americano. But you won’t get those super-fancy Starbucks drinks of course. Instead of using milk, this system uses 100% natural dried milk pods so the lattes are very easy to make and you don’t have any messy cleanup. The espresso in particular comes out great with the crema that espresso lovers expect and the taste is excellent. The system is very easy to use, and all of the parts work seamlessly together. It’s easy to add water, clean by rinsing and also adjust the drip tray grate to adjust for different size cups. The machine warms up quickly in about 15 seconds so you can get your coffee fix right away when you need it. So when you wake up on Christmas morning this year with your lovely lady (or some warm body if you’re not attached), impress her with a quick espresso!